Last year saw the election of Danica Roem to the Virginia House of Delegates. 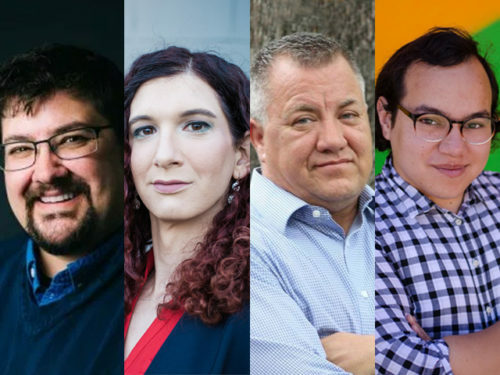 Roem, as well as more than a handful of other transgender people who won races last November, have shown that transgender people can run for — and win — political office. This November, there are four potential transgender state legislators eying seats. We asked each of them if being transgender plays a part in their run, and what issues they were championing in their home states. Everett Maroon is running for the 16th legislative district in Washington State. A resident of the area with his wife for a decade, he has had a strong focus on health care, serving as the co-chair of the Greater Columbia Accountable Community of Health’s opioid demonstration project, as well as serving as the executive director of a healthcare-focused nonprofit. Maroon is, as he put it, “running in a red district in a blue state,” but hasn’t seen a lot of blowback because he is trans. “It’s only come up in one mainstream forum, and it was mentioned in a pretty neutral way. I have heard rumbles that there is a faction of opposition who want to make issue of my trans status, but as many people know I published a memoir in 2010 about my transition, so that bird has pretty much flown the coop,” said Maroon. His goals, of course, include health care and the opioid crisis, both of which are a concern in the 16th District. Maroon is also pushing on issues surrounding housing instability, as well as infrastructure improvements throughout Eastern Washington. Brianna Titone moved to Colorado a decade ago. A geologist by trade, her career brought her to the state. She has since worked as a mining consultant, a substitute teacher, and as a web application developer. She’s running for Colorado House District 27. Initially a political outsider, she began to get involved in local politics in 2012, serving as a Delegate for Bernie Sanders in 2016, then being appointed as Captain at Large for the Jefferson County Democratic Party in October 2017. Titone feels that being trans has given her the ability to be able to take harsh criticism and to relate to other marginalized groups and their struggles. She hasn’t seen a lot of negative feedback being a trans woman seeking office, but did point to one issue she has had to deal with: her voice. In her district, she points to education funding as a big issue. “Our state has struggled to fund education because of our complex and often frustrating tax laws. For a state with a great economy, we are at the bottom in per-pupil spending and teacher pay. I don’t want to see the next generation of kids get off to a bad start in life because they can’t get a good education,” said Titone. She is also championing environmental issues — particularly with an eye towards science-based legislation — high speed Internet, and net neutrality. Running for the Texas House of Representatives, District 94, is Finnigan Jones. He’s a native Texan, born in Austin and raised around Dallas/Fort Worth. After serving in the United States Coast Guard, he went to work in the medical industry, then in aerospace. He and his wife also work on transgender causes, founding Trans-Cendence International, Inc., a non-profit support organization for the gender diverse community. When asked if being trans brings anything special to his campaign, he too stressed his empathy. Jones added he’ll bring a different view on another issue important to local residents. Of course, last year Texas forced a special session of the legislature, in a failed attempt to pass anti-transgender bills. They have threatened to do this again, which adds an extra wrinkle to the campaign. Nevertheless, Jones doesn’t feel being trans has affected his campaign so far. “I think I am seen as just another candidate. In fact many of my fellow candidates did not realize I was trans until months into the campaign,” said Jones, stressing that the race would likely be different if he was a trans woman. He has a lot to say beyond being transgender, of course. “I have been asked many times if I am a ‘one issue’ candidate. I try and assure voters that that is not the case,” Jones said. Among his top issues are public education, including a living wage increase for teachers and repairing insurance issues for retired teachers. He is also looking to expand Medicaid in Texas, working on common sense gun legislation, and many other issues. Hailing from Billings, Montana, Amelia Marquez is running in House District 52, representing Yellowstone County. A graduate of Montana State University, she currently works for a non-profit mental health organization for kids, as well as serving as the Yellowstone County Democrats Vice Chairwoman. She feels that being trans brings a different perspective to the race. “We live in such a binary society,” says Marquez. “We look at everything as black and white. I am campaigning to represent one of the most diverse districts in Montana. We need someone who will look at each bill from a different perspective. Being a trans woman hasn’t heavily affected her run thus far. “When we are out knocking doors, me being trans does not really get brought up, she says. “Some folks ask about me being trans, but I am there to talk about the issues that are affecting the working class. As I have said numerous times throughout the campaign, this campaign is not about me, it’s about us,” she added. She’s championing an issue dear to her heart. She’s also talking about domestic violence, which has been skyrocketing in Montana. She is also working on issues surrounding missing and murdered indigenous women in the state.